Detriti Records, the Berlin based creature of Davide Lace, it’s one of the most unique labels in the contemporary european underground scene. 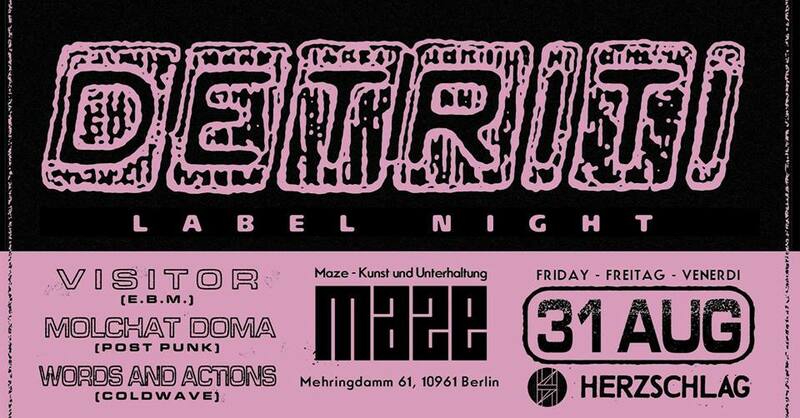 Born in 2015, Detriti focuses on the experimental side of 80s underground music. Industrial, Acid House, EBM, Synthwave, New Beat, Darkwave are the main genres hosted by the label. Limited editions’ cassettes and vinyls is the trademark of Detriti and a special mention deserve the covers’ graphics and the teaser videos: monochromatic xerox images get mixed with glitchy VHS footages, with the result of throwing the audience in the dustiest squat of 80s Berlin. Visitor is a two piece Canadian act comprised of Veronica Stefanuik and Philip Traikovski that seamlessly combines the best elements of old school EBM with new beat, the result is something out of time yet uniquely modern. Dark frantic beats and bass lines, Visitor will take over your body. Their 12” LP “Expat” (May 2018) is already at the second repress only after 2 months from the release date. The Belarusian band M. D. was created in 2016 by Yegor Shkutko and Roman Komogortsev. The full composition of the group was completed in the winter of 2017. Inspired by bands like New Order, Alphaville, Kraftwerk, The Cure, Biokonstruktor, Альянс and Кино, in the autumn of 2017 the band releases their first full-length LP “S krysh nashikh domov” (“From the roofs of our houses”) for Detriti Records. Earworm melodies, amazing songwriting skills and lo-fi vibes are their trademark. “Words and actions” is an electronic post punk project from Italy, now Berlin based, formed in 2010. Coldwave, old school ebm, synth-punk are the main influences. Turning-point of WAA production is the album “Pensieri di nessuno”, certainly the most personal and mature work of the singer and musician Davide Lace. In this album the gloominess of French coldwave meets the energy and minimalism of the German old school EBM and the charm of the Yugoslavian darkwave. The Italian lyrics give a further touch of exoticism and mistery. Borghesia, Malaria!, DAF, Liaisons Dangereuses but also the Italian CCCP are the main inspirations. Low-fi sounds, xerox graphics cassette tapes and VHS videos hold up the raw image of this project whose loyalty to 80s DIY underground post punk is undeniable.